There’s a little bit of repeat here since I didn’t have pictures ready to go a couple of entries ago. Saturday morning Anita was still down in the South Bay so I woke up to an empty house. 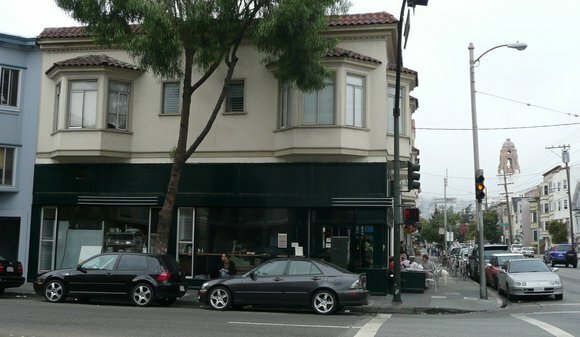 After pulling on a sweatshirt I walked several blocks to Tartine, the Delfino-owned bakery and cafe at 18th and Guerrero. I previously mentioned about the French visitors who occupied a pair of tables next to me and helped my sympathize with Tawn. The food was so good on the first visit that I made a second trip on Tuesday morning. I’ll combine the pictures into this entry. 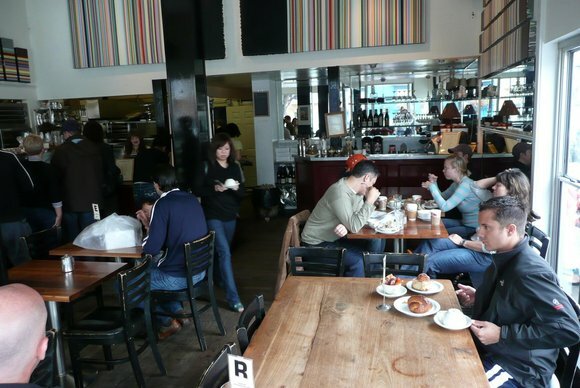 The interior is always crowded and there is a large communal table that people – as the name implies – share. Instead of numbers, they use letters. Interesting, huh? Follow-up dish: morning bun on the left and bread pudding with peaches and olallieberries the size of your thumb on the right. Remember – this was over two days, not at a single meal. Later in the morning I headed over to Oakland to meet Bruce and Howie for lunch. The destination: Zachary’s Pizza. 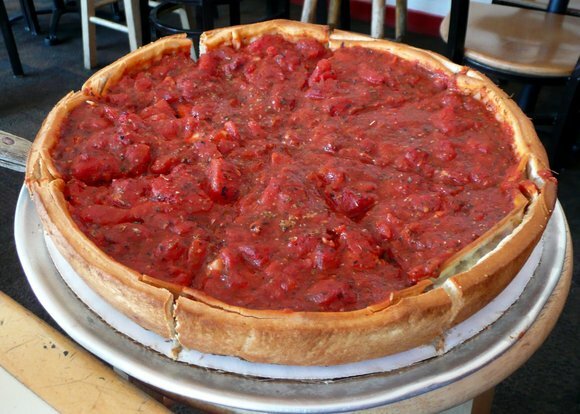 Celebrating 25 years, Zachary’s deep-dish stuffed crust pizza is an amazing, amazing thing to eat. Below, the College Avenue location, about two minutes away from Rockridge BART station. The pizza in question – double crust stuffed with spinach and mushrooms with a spicy tomato sauce on top. Moments before we dig in. Bruce on the left and Howie on the right. Afterwards, we enjoyed the sunny afternoon for a bit before driving back over to the City. What a treat! Next entry… Saturday evening and GAPA’s 20th Anniversary Runway show. 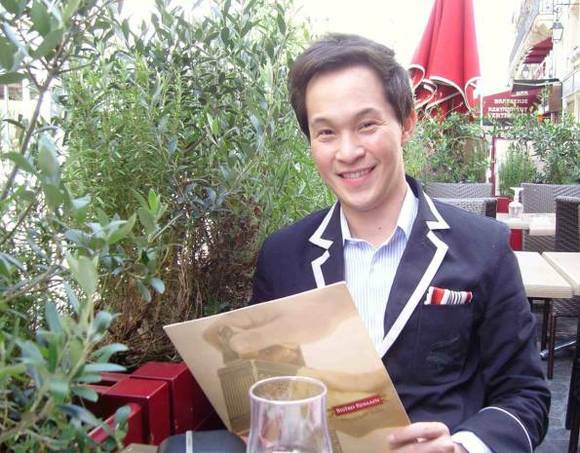 Tawn arrived in Paris Saturday morning and was enjoying his first day in the city of lights. While Ryeroam was working Tawn explored the city and enjoyed a little petite dejuener at a sidewalk cafe. This entry was posted in Uncategorized and tagged California, France, Paris, San Francisco, Tartine, travel, United States, Zachary's by christao408. Bookmark the permalink. The bakery / cafe with the communal table looks like a very comfortable hangout for solo travelers. Tawn looks so classy and dapper! I didn’t know Tawn was getting to stop in Paris. Je suis jalouse! Hope you’re enjoying your trip immensely! Thanks for the ever beautiful pix! Your trip looks like a lot of fun. the food pics are nice too. I am so glad you are home Chris. I hope you have a marvellous time here before you head back to your real home. I got back last night about 11 pm. Had a fabulously fantastic trip to Istanbul. What wonderful pictures. You all look fabulous & the food. . . . to die for. That pizza and quiche look YUMMY! Mmmmmmm! @ElusiveWords – It is a really neat experience to share tables with neighbors. @stevew918 – The picture really is the icing on the cake. 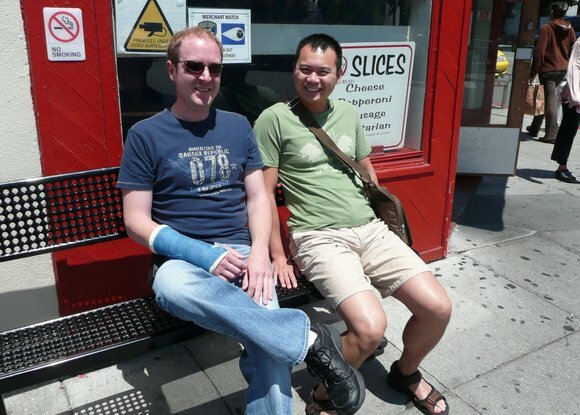 @gyjcwang – San Franciscans enjoy lining up for really good food. 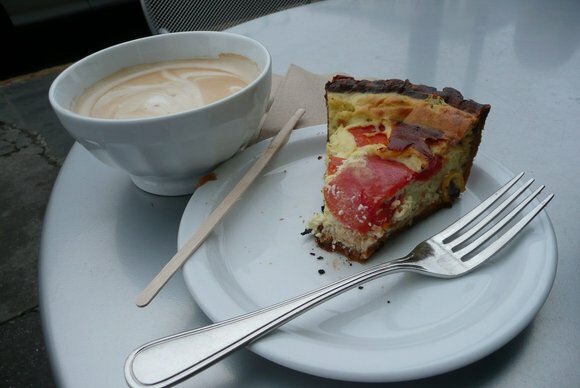 I’d argue that Tartine has some of the best pastries in the City. 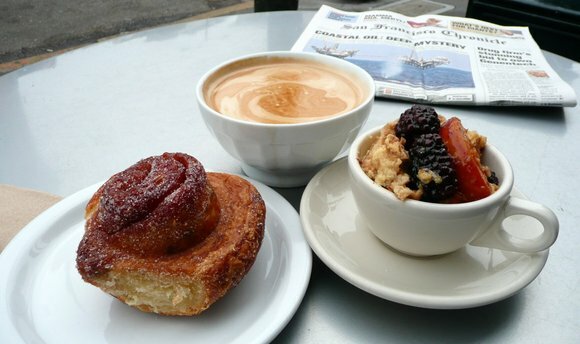 That was something I really enjoyed about living in the City; it is a great place to be a foodie. Didn’t see your boyfriend at Runway but then I don’t know what he looks like. I’ve never been a GAPA member. While I’ve long supported their goals and count untold numbers of friends among their membership, I was under the impression that as a potato I couldn’t be a member. @UFFda_oyVEY – Am enjoying the trip very much, thanks. @chrispycrunch – Thanks, Chris. Pics aren’t nearly as nice as yours, but what can I do? @ZSA_MD – Welcome home! I’m so excited to hear about your trip. No doubt there are all sorts of great adventures that have been had. @jojobaDESIGNS – Thank you very much. 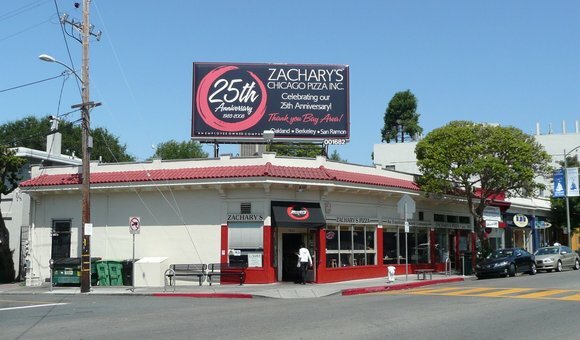 @brooklyn2028 – Sheldon, if you ever make it to the Bay Area, you must go to Oakland or Berkeley and eat at Zachary’s. It is fantastic pizza and very different from most other pizzas I’ve had. @prachya – It would be so nice to meet you in SF. Unfortunately, I won’t be back until the 30th and then just overnight as I head down to LA for the weekend of the 1st-3rd. Why don’t you continue your trip southwards? @prachya – Wish I could add YVR to the trip. Great time of year to be there. Have a good time and certainly do let me know next time you’re back in Khrungthep. I have never been to SF, but I’ve always wanted to go. You are certainly making me want to go again. We were ready to go on our way home from Nevada once, but the morning we were to leave was the big quake. Obviously, that scrapped that idea. That pizza reminds me of a deep dish sourdough pizza Tom and I used to get in Seattle while we were dating. Sadly, the restaurant is closed now. 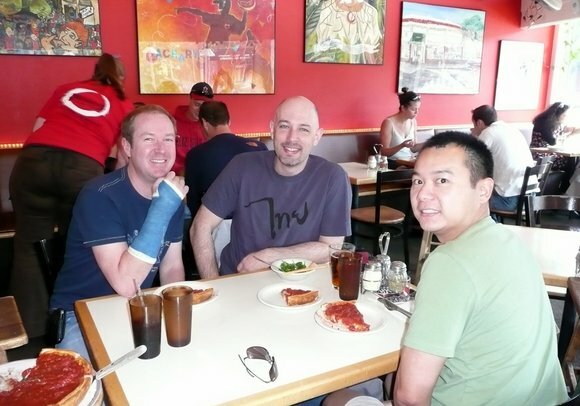 @socaltransplant – If you ever plan on heading to SF, let me know and I’ll provide some recommendations.